This is my own design, I love cartoon so much. Tend to korean cartoon. This template suitable for a girl, or whoever you are that luv cartoon. You just need to adjust link menu at the top. Easy to customize. Bong, aku dadi eling ambek SILVERQUEEN. Pingin tuku nang Alfa Mart sebelah omahku. wah, gak cucuk bong karo diriku..
eh, kartune kuwi kowe nggawe dewe?? omagooosh!! jurusanmu opo to bong?? How can I change the default search form to my google custome search? Any help will be appreciated. thanks, i,m using this template. can edit the title header such as alignment? hi ya~~thanks dor the template~~i wanna delete or change the emotion icon but how? saya suka bangat dengan themes ini. i'm really love all this themes inside this web.. but unfortunately not in WP.. I WANT TO DELETE HOME, CONTACT US BUT HOW ? bagus banget templatenya, tapi aku gak bisa and gak tau cara masangnya di blog aku, tolong dong kasih tau ya ! can i get the code for this template? I like this design. Thanks for sharing. For more website design & templates you can have a look at our site. sipp dech good idea... thanks for share.. Cute Toon so lovely and more beautiful shared on the site so that can be enjoy it in this blogger.Mostly are very like it and enjoy it. The grateful and enjoyable blogger so that can be enjoy it in this blogger and enjoy it. This is very nice and informative post shared on the site. 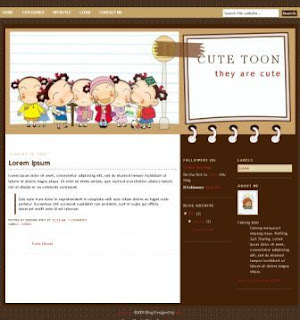 Cute Toon blogger is very nice and more interesting and enjoyable blogger so that can be know that in this blogger. Often people are very like it and enjoy it. So nice cute toon blogger and more interesting blogger so that can be enjoy it in this blogger and enjoy it. Often people are very like it and more interesting blogger. in this cartoon so very well and fantastic cute ton shared on the site so that can be enjoy it in this post. Mostly people are very like it and enjoy it in this blogger.